Madeline Wisecarver, winner of the 2012 Brock Jarrett Toledo Memorial Scholarship. VISALIA — Visalia Mineral King Masonic Lodge #128 has recognized three outstanding educators from the Visalia Unified School District, including Hanford resident Cheryl LaVerne, principal of Manuel Hernandez Elementary School. 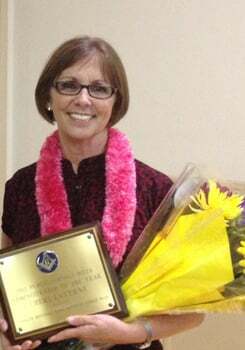 LaVerne was named Administrator of the Year, while Pam Ross, principal's clerical assistant at Oak Grove Elementary School, was named Employee of the Year and Jim Pitkin, a social science teacher at Golden West High School, was named Teacher of the Year. Under LaVerne’s leadership from 2004 to 2008, Linwood School moved from API scores in the mid-700s to four straight years above 800, the last three years between 838 and 842. In 2008, Linwood School was designated as a California Distinguished School. With the opening of the new Manuel F. Hernandez Elementary School, LaVerne and her staff committed to earning the Distinguished School designation. In February, they were informed that the school would indeed be awarded this honor. DINUBA — Ruiz 4 Kids, a nonprofit organization formed in conjunction with Ruiz Foods, has awarded scholarships to six Hanford high school seniors. Hanford students receiving scholarships are Justin Lourenco, Madeline Pedro, Colin Seward and Vanessa Silva of Hanford High School and Melissa Canchola and Maria Rodriguez of Hanford West High School. For 2012, Ruiz 4 Kids awarded over $200,000 in scholarships to 194 high school seniors and college students. Since 1985, the program has awarded nearly $1.5 million in scholarships. 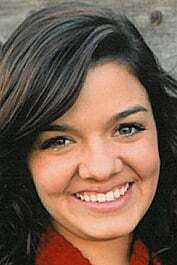 HANFORD — Madeline Wisecarver of Hanford High School has been selected as the 2012 recipient of the Brock Jarrett Toledo Memorial Scholarship. Wisecarver, the daughter of Doug and Susan Wisecarver of Hanford, will be attending Oklahoma State University in the fall with an agribusiness major. Wisecarver is a 10-year member of 4-H and has been active in Hanford FFA. She is currently serving as president of the California Junior Livestock Association. The scholarship was established by the Toledo family in memory of their son Brock, who died in February 1996. LEMOORE — The Tulare-Kings chapter of California Women for Agriculture has awarded a total of $5,500 to six scholarship recipients in Tulare and Kings counties for the upcoming school year. The recipients, who plan to major in agricultural-related fields, include Kelsie Raulino of Lemoore High School, who received $500. Tulare County recipients included Josh Polich, Golden West High School, Visalia ($2,000); Austin Della, Harmony Magnet Academy, Strathmore ($1,000); Jordan Dunn, Golden West ($1,000); Haley Seeger, Golden West ($500); and Casey Erickson, Modesto Junior College and 2010 graduate of Porterville High School ($500). AZUSA, Calif. — Hanford resident Kayla Johnson has graduated from Azusa Pacific University with a B.S. in nursing. Johnson joined nearly 1,400 graduates at the school’s spring commencement ceremonies. Azusa Pacific University is an evangelical, Christian university. SIOUX CENTER, Iowa — Two students from Hanford received diplomas from Dordt College at the school’s 2012 commencement ceremony. Gerrit Van Leeuwen graduated with a B.A. in communication with an emphasis in public relations. He also has a minor in human resources. Peter de Jong graduated with an A.A. in agriculture. Dordt College is a comprehensive Christian college rooted in the Reformed tradition. HANFORD — Women with Visions Unlimited, Inc., a local community-based organization, is accepting enrollment for its summer school program. Students will be enrolled on a first-come, first-served basis. The focus will be on math and reading. Classes will be held daily from 9 to 11 a.m. from June 11-29 at the Irwin Street Inn. Registration forms are available at inn, 522 N. Irwin St. Hanford. The deadline is May 31. The program is open to incoming students in first through sixth grade. The cost is $40 per student. A light snack will be provided daily. For more information, call Carolyn Hudgins at 583-6139. LEMOORE — The Lemoore High Sober Grad Committee is seeking donations and raffle items for its 2012 Sober Grad Night set for May 31. To make donations, contact Pam Rinaldi at 936-4452 or Lemoore High School at 924-6600, ext. 243. HANFORD — The first 2012 Sober Grad meeting for Hanford high schools will be held Monday. The meeting will take place at 6 p.m. at Help-U-Sell, 107 7th St. in Hanford. Parents of graduating high school seniors and community members are encouraged to attend. For more information or to volunteer, call Kimber Regan at 572-0618 or Suzanne Downing at 381-8008. HANFORD — Graduates of one of the Hanford Joint Union High School District high schools who have successfully completed one year of college, vocation and/or trade school and are currently a full-time college student are eligible to apply for a loan of up to $3,000 through the district’s Orchard Trust program. Application packets are available with the Kings County Public Administrator Tom Edmonds or may be requested by mail to P.O. Box 986, Hanford, CA 93232-0986. For more information, call 583-5901, ext. 3112. CORCORAN — Corcoran High will held a reunion of all classes from the 1950s Sept. 22 at the Holiday Inn in Visalia. All classmates from the 50s are invited by the Class of 1956 to celebrate history together. The cost is $44 per person and includes the afternoon hospitality room, a seated dinner and a show of memories led by three popular masters of ceremonies. For more information, visit www.Corcoran1956.com or email Wayne Crow at cwcrow38@gmail.com . CORCORAN — The Corcoran High School Class of 1962 is now planning its 50-year reunion. The reunion will be Oct. 20 at the Kate Boswell Center. It will include the classes of 1961 and 1963. Anyone in these graduating classes who has not been contacted and is interested in attending should call Linda Rabe at 585-1810. Please email education briefs a week prior to publication to features@HanfordSentinel.com.